45% GENERAL TAX REBATE for FIVE YEARS! 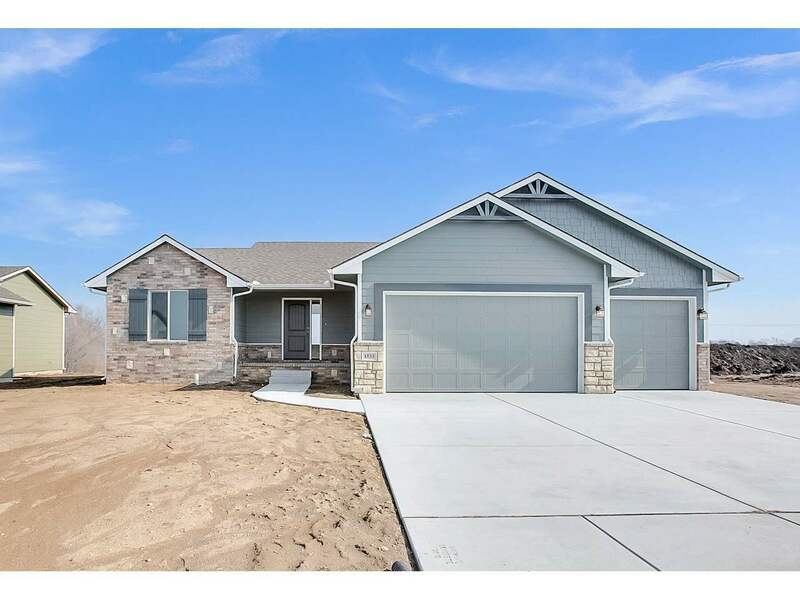 Beautiful new home by Don Klausmeyer Construction, nearly complete, in the newest phase of Prairie Creek, 3rd Addition in Andover, KS! This very popular, roomy, Morgan B floorplan features 3 split-bedrooms and 2 baths on the main floor, a 3-car garage with 8' doors, and a covered back patio! It also features luxury upgrades including wood laminate flooring in the main living areas, wide base and trim, and wood-wrapped windows with crown molding. The kitchen boasts granite countertops, a large island with an eating bar, staggered cabinets, and a large, walk-in pantry. The master bedroom has vaulted ceilings, and the master bath has a 5' shower, a walk-in closet, and a double-vanity with two sinks! Exterior features include stone, timber in the gables, and cedar trim. Additional lots are available, including daylight, lake view, and cul-de-sac. The current model at 1505 N Aster is open daily from 12-5 (closed Fridays), so come take a look!